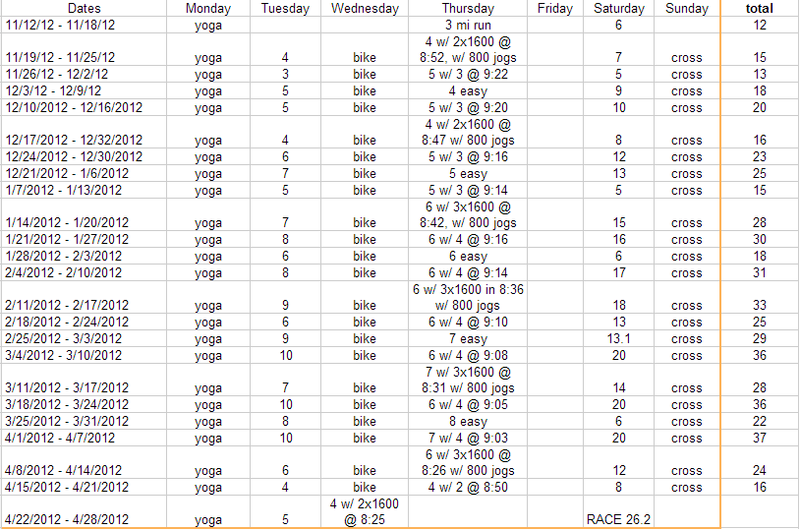 This is my first week of recapping my training, but according to my marathon training plan this is week 4. To keep things simple for me, I am starting to number at 4. My training plan is 24 weeks long which is quite a long time for a training plan in my opinion, but the mileage is low to start with and isn't too challenging so far. I combined two training plans to come up with a good training plan for me. I'm using the Tuesday runs and Saturday long runs from the Hal Higdon Marathon 3 Plan and the Thursday speed work runs from an individualized plan from Runner's World Smart Coach. I liked the slower build-up of mileage in the Marathon 3 plan, but am hoping the speed work will shave a few seconds of my average pace. 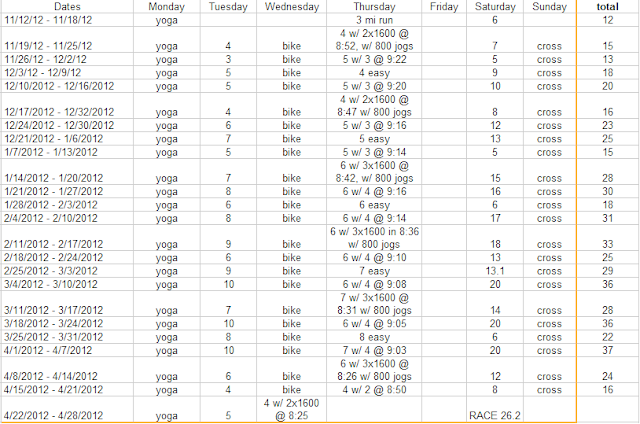 This is what I have for a training plan so far. Of course, this schedule is adjustable to whatever I feel like doing for the week. And this week is a good example of that. Here is what I ended up doing. This past weekend I was invited to a Christmas/Ugly Sweater party hosted by a friend of Matt's in Cortland, Illinois. It was a treat to see and hang out with several of his college friends again. Of course I indulged in much too much alcohol on both Friday and Saturday nights, but thankfully didn't get too out of control this time. I woke up around 8:30 on Saturday to head out for a run. Another guy was running as well, but he was much faster than I so we didn't run together. I got to run on some low traffic country roads which is one of my favorite places to run. No stoplights, no other people, not very many cars and nice scenery. I felt surprisingly good. My goal pace for the marathon is supposed to be 9:34 so I actually could be running long runs a bit slower. I have always just tried going at a comfortable pace and that has worked for me. I have 10 miles on the schedule for this week and I will be in the very hilly land of Cascade. I'm not looking forward to it. What's your favorite place to run?